As most video formats are supported by different OS platforms, there are many people who deride the requirement of video converter software, however, as per the last count, there are more than 166 types of video formats currently being used throughout the world and the number would continue to increase. 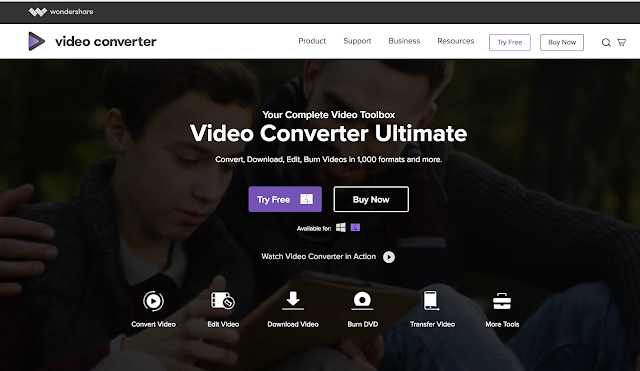 The best video converter in the market, this software enables you to convert more than 1000 video formats and the company continues to update new formats at regular intervals and includes most common formats such as AVI, MKV, and MOV. The conversion also enables you to enjoy the same video on various devices such as Android, Apple devices, and game consoles. This is possible due to various technologies that are used such as GPU Accelerator, optimization for multi-core processor and lossless conversion technology. The next interesting feature of this software is an inbuilt video editor. With an in-built and easy-to-use video editor, you can easily customize your home movies and convert them into professional work. With its help, you can also make your video stand out in the crowd. The next feature is downloading video from various websites. Downloading videos have never been so easy or quick before using this software. Record or download your favorite videos whether they are 4K or HD videos from more than 10000 sites including Dailymotion and YouTube. After downloading you can enjoy these videos without an internet connection or you can convert them into some compatible format for smartphone, TV or other devices. After downloading your favorite video, if you want to store it on DVD, you do not need to search for any other software to burn DVD, as this software itself offers in-house facilities for burning DVD. All you have to do is to get a blank DVD and put it in the DVD drive. With a click of the mouse, this software burns DVD in a few minutes. This software offers a wide-ranging toolkit that enables you to convert any format to DVD, offer free DVD templates, and edit these files with a built-in editor. However, what if you just want to transfer your video to any external devices? For that purpose, the software offers an innovative feature. Transferring video to other external devices such as Android devices, Apple devices, USB flash drives and external hard drives is a prelude to sharing and watching videos. If there are any unsupported formats, the software converts it into a compatible support during the transfer itself. With continuous increase in digital media, namely video files throughout the world, the number of video formats also continues to increase at a fast rate. With this increase, the requirement for converting a video into different formats is also increasing at a fast rate. The users also require handy features in video converter software such as downloading video, editing it, transferring it and burning DVD. With the launch of this software, it has become easy for users to avail all these conveniences under one roof.